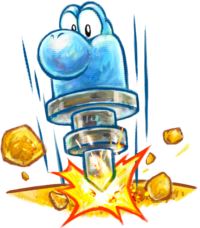 Jackhammer Yoshi, also known as simply the Jackhammer, is a form the Yoshis can transform into in Yoshi's New Island by entering a door with a jackhammer sign on it. In this form, the Yoshi can break through rocks; some of them take more time to break than others, often resulting in a set pattern of rocks the Yoshi needs to break. Like all forms, Yoshi only has a limited amount of time before he reverts to normal and is sent back to the door; clocks scattered about the obstacle course provide the Yoshi with more time. Going through a ring will simply return the Yoshi to normal. This page was last edited on December 6, 2018, at 11:58.